Silver Trees is a Static Holiday Caravan Park, you can purchase your own holiday home for weekend breaks holidays or longer stays. Located in the midst of Cannock Chase Country Park an area of Outstanding Natural Beauty. We appeal to those seeking peace and quiet, Wild Deer visit from the Nature Reserve located nearby, they will wander right amongst the holiday caravans, which is why we seek to attract visitors who will respect and enjoy the peaceful surroundings. 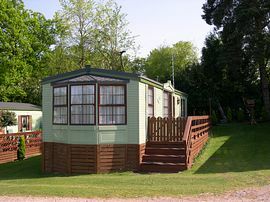 Caravans are individually sited amongst grass surroundings with trees and shrubs. Views over the valley. Wild Deer wandering through the holiday caravan areas. Indoor Swimming pool bookable for private sessions. Between Rugeley and Penkridge on Cannock Chase about 2 miles North West of Rugeley Town centre and railway station. approx 300 mts from Birches Valley Forest Visitor Centre. Site Fees For Private Holiday Home owners £1499.70 plus £175.40 Rates annually. Hire Fleet caravans from £249.00 per week or Short Breaks from £119.00. 1st March to 15th January following year.